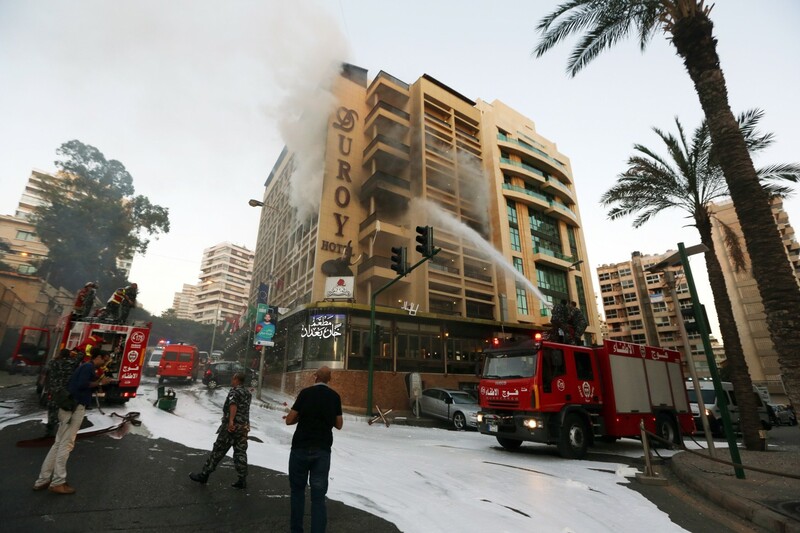 JNN 26 June 2014 Beirut : About a dozen people, including three members of security forces, have been injured in a bomb attack at a hotel in the Lebanese capital. The two had taken refuge in Duroy Hotel near the Saudi Embassy in the Raouche neighborhood of Beirut when Lebanese security agents raided the hotel after receiving intelligence of their stay there, security sources said. Machnouk also said that it was not the first time that security forces have prevented bombers from reaching their targets. The attack came a day after a car bombing in a southern neighborhood of Beirut killed a security officer and injured at least 20 people. Lebanon has been suffering from terrorist attacks by al-Qaeda-linked militants as well as random rocket attacks, which are viewed as a spillover of the conflict in Syria. It was the third suicide bombing in Lebanon in less than a week and sparked fears of renewed violence in a country that has been deeply affected by the civil war in neighboring Syria. On Monday, a suicide bomber blew himself up near a checkpoint outside a cafe just after midnight in a primarily Shiite neighborhood where the militant Hezbollah group has a strong presence. The bombing killed one person and wounded 20. An al-Qaida-linked group, the Abdullah Azzam Brigades, has warned that such attacks will continue as long as Hezbollah takes part in Syria’s civil war alongside President Bashar Assad’s troops. Syria’s civil war has spilled into neighboring Lebanon on numerous occasions. A series of car bombs have struck Shiite areas across Lebanon, killing dozens of people. The bombings, coupled with the detention last Friday in Beirut of people accused of being part of alleged Wahabi Terrorist sleeper cells, has given rise to concerns that Lebanon could see a new wave of violence linked to the Syrian conflict. This entry was posted in Lebonan, Middle East and tagged BEIRUT, Beirut hotel, Beirut’s Duroy Hotel, Bomb Blast, Lebanon, Saudi Man, security forces, Suicide Bomber. Bookmark the permalink. MAR GAYE MARDOOD JINKA . FATEHA NA DAROOD . (Gone were the bastards to Hell for whom no one mourn or recite fateha) WANT MORE PROOF THAT THE FAOUNTAIN OF TERRORISM IS AALE SAUD AND WHY NOT THEIR DUALITY ON LINEAGE OF BASTARDISM MAKE THEM THE EASIEST VICTIM OF SHAITAAN .SO MUSLIM OF WHATEVER DENONIMATION IS KILLED , IS A MATTER OF PLEASURE & SATISFACTION FOR THEM . NOW NO MUSLIM COUNTRY WITH SHIA- SUNNI POPULATION SHOULD IN ANY CASE ALLOW THEIR EMBASSY TO CONTINUE ,THAT THERE IS NO SAUDINATIONAL WHO IS ISSUED A VISA . THE SHIA â SUNNI POPULATION SHOULD TAKE VIGILANCE THAT THIS IS strictly followed .. THEIR RECRUITING ACTIVITIES OF SUICIDE BOMBERS FROM POOR COUNTRIES which is a matter of their policy SHOULD ALSO BE CHECKED . THIS WAS A RERE CASE , OTHER WISE THEY DONâT PUT THEIR OWN WAHABI NATIONALs TO BECOME A CASUALITY OF THEIR NEFARIOUS ACTIVITIES .POOR BANGLADESHIS ARE THEIR EASIEST TARGET . POOR DARKIES ARE EASILY ATTRACTED TO FAIR HOURIES AWAITING THEM IN JANNAH LET ALLAH ELLIMINATE THEIR FILTHY EXISTANCE , SOONER THE BETTER.